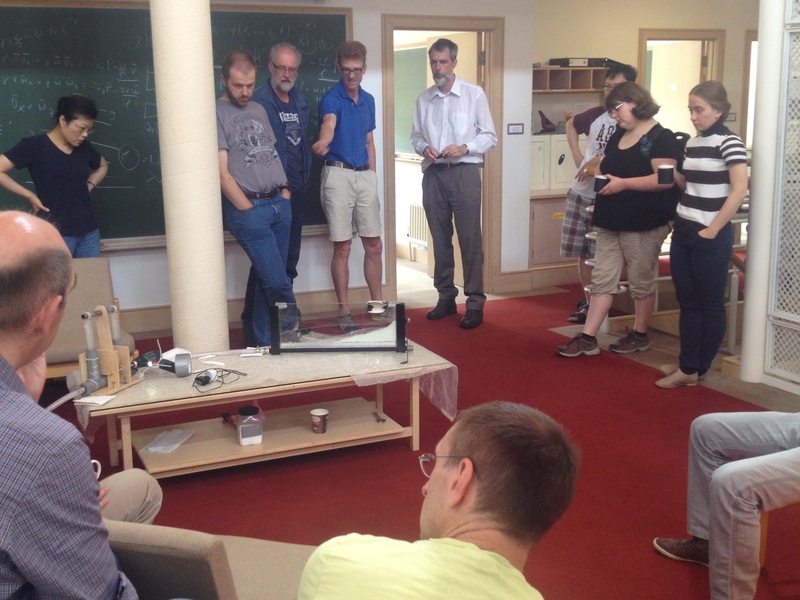 On Monday 21 July, Onno Bokhove set up a demonstration of wave breaking in a Hele-Shaw cell in the common room of the institute. It is a scaled-down version of an experiment at the University of Twente. Fluid is pumped in periodically on the left (in the figure above) providing sufficient horizontal momentum to create a breaking wave. There is a layer of white particles along the bottom which are forced to move by the particle velocity below the breaking wave. In the above figure, from left to right in the background, are Jie Yu, Bernard Deconinck, Peter Janssen, Onno Bokhove, Mark Cooker, Phillipe Guyenne (partially hidden), Charlotte Page, Elena Gagarina, and in the foreground are Guido Schneider and Mark Groves. Photo credit: Katie Oliveras.